To the Chinese, foods have ‘yin’ and ‘yang’ properties. Yin foods have ‘cooling’ properties while yang foods have ‘hearty’ properties. On the other hand some foods are ‘neutral’. Since the old days, the Chinese strongly believed that DIET plays an important role in achieving a balanced ying / yang for an individual. In Malaysia where it is always warm and humid, consuming ‘cooling’ food to counter the ‘heat’ — such as old cucumber soup ….. is definitely a MUST. It is also believed that this soup is also good for the skin and helps prevent aging. It is high in dietary fibre, calcium, iron and rich in vitamin A, B6 and C. With such wonderful properties about the soup, it’s no wonder this soup is most common and popular in Asian countries especially Singapore and Malaysia. Almost every Chinese family knows how to prepare this soup dish. To the Chinese, foods have ‘yin’ and ‘yang’ properties. Yin foods have ‘cooling’ properties while yang foods have ‘hearty’ properties. On the other hand some foods are ‘neutral’. Since the old days, the Chinese strongly believed that DIET plays an important role in achieving a balanced ying / yang for an individual. <br><br> In Malaysia where it is always warm and humid, consuming ‘cooling’ food to counter the ‘heat’ — such as old cucumber soup ….. is definitely a MUST. It is also believed that this soup is also good for the skin and helps prevent aging. 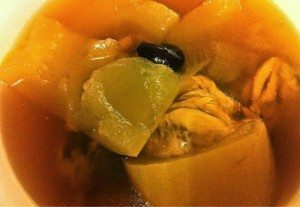 It is high in dietary fibre, calcium, iron and rich in vitamin A, B6 and C. With such wonderful properties about the soup, it’s no wonder this soup is most common and popular in Asian countries especially Singapore and Malaysia. Almost every Chinese family knows how to prepare this soup dish. Scrub the skin of old cucumber, clean and cut it in half, lengthwise. Scoop out the seeds using a spoon. Cut into smaller pieces. In a small pot, blanch the pork ribs/ chicken meat in boiling water for a few minutes ( so as to remove the scum bits ). Drain the ribs/ meat and set aside. In a soup pot, add old cucumber pieces, blanched ribs/ chicken, water, dates, dried scallops, dried cuttlefish, sweet corn and carrots. Bring to a boil. Then reduce heat and simmer the soup over low heat for about 40 minutes. Season to taste with salt. I used a pressure cooker to boil this soup. Step 1 and 2 remains the same. In a pressure cooker, add the old cucumber pieces, blanched ribs/ chicken, water, dates, dries scallops, dried cuttlefish, sweet corn, carrots and salt. Then close the lid tightly. Bring to a boil ( high heat ). When pressure cooker sounds, reduce heat to low and cook for another 15 minutes. Then turn off the heat. Wait for pressure to release and it’s ready to be served. Soup will taste sweeter with dried scallops, cuttlefish and red dates. Cook old cucumber with skin intact. Soak the whole old cucumber in salted water for 15 minutes. Scrub and wash the skin thoroughly before cutting into pieces. Seeds can be removed or remained. Adding adequate salt is crucial. Taste of the soup should be subtle, not bland. Whenever I drink this soup, it will bring back memories of my childhood when my mum used to cook this soup for us all the time…… Thank you mother! I really miss your cooking and I really miss you. 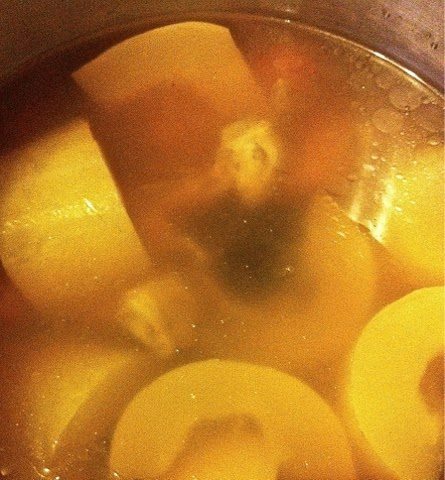 Nourishing Chinese tonic soup that helps to cool and revitalize our body! Hope you are convinced on the wonderful goodness that comes with drinking this soup.